The rates are 1911 Basic rates and are subject to current district percentages. This price list is subject to 6 months notice on either side. Charge man’s rates: shall not exceed 5s (25p) per shift for 1st chargeman and 3s (15p) for others. House coal allowance for underground and surface workers to continue as before. There was a strike at Nottinghamshire pits from 13th -18th September 1943 (24,000 men), over pay rates? This was an unusual case as the Nottinghamshire miners were fairly placid so it must have been serious because withdrawing labour during the War was tantamount to treason. In February 1943 a team of 43 American oil workers from Texas and Lousiana had arrived in Nottinghamshire to develop the Eakring oilfield to help with the War effort as supplies were running extremely low due to constant raids by the enemy on ships bringing oil from America and Iran. Following top secret meetings with Winston Churchill who was unaware of the Eakring oilfield, an envoy Mr Southwell (from Southwell) was sent to Oklahoma in America to ascertain whether help could be available. Eventually help was given, and drillers brought over from the USA as well as their expertise in drilling, all variety of equipment and collapsible drilling rigs that could be erected and ready for drilling in a few short hours whereas the English drillers took 2 or 3 weeks to build their rigs, and neiher could they drill as fast as the Americans. The equipment was given free but wages were to be paid by the company. However there were quite a few holes drilled producing oil prior to their arrival. The oil had been discovered in 1939 in the dome of the Eakring anticline with No1 well striking the oil at 1,912 feet (583m) deep. Duke’s Wood, planted in 1700 had been acquired by Lord Savile of Rufford Abbey in 1860. 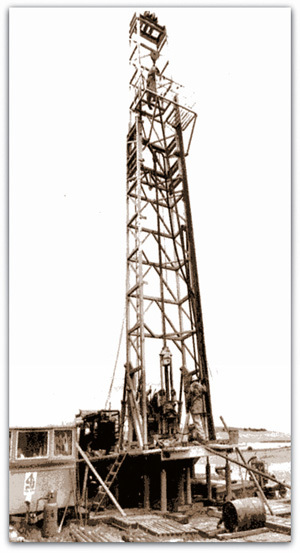 The Petroleum Production Act of 1934 allowed drilling for oil. The D’Arcy Exploration Co purchased Duke’s Wood in 1938 but by 1941 the British Government had set D’Arcy a target of 100,000 tons of oil per year. This was not being achieved. The Americans and their equipment were shipped over from the States in 3 different boats in case of being sunk by a German U boat. In 1943 the ‘Wild Catters’ or ‘Rough Necks’, residing at Kelham Priory with the Monks, on a 12 months contract from February 1943 to March 1944, (when they returned home, where they were then elegible for army service), sank 106 wells, producing 3,000 barrels a day (40 gallons to a barrel). It was one of the best kept secrets of the War as nobody thought there was oil under Sherwood Forest. The oil was pumped into tanker wagons and shunted into Bilsthorpe Colliery sidings only a short distance away, before being sent to the prescribed destination. Unfortunately one young driller was killed when he fell off the 200 feet (61m) high rig. There were many other accidents among the drillers, the less experienced ones losing fingers or toes after releasing the rods drawn out of the holes using stilsons to break the seals and when lowering them to the floor to be stacked in the derrick. 169 holes would be drilled at Duke’s Wood altogether but curtailing the development of Bilsthorpe Colliery in that direction. The oil was of exceptional good quality, and was refined for use in the Rolls Royce Merlin engines of Spitfires during the War. A German spy plane had taken a photograph of the site during the War and a raid was made, but the village of Edingley nearby was bombed instead as the raiders had mistaken the village for the oilfield. Oil would be pumped down the pipeline PLUTO (pipeline under the ocean) from the Isle of Wight to Normandy following the invasion of France in 1944. By 1945 the East Midlands oil wells would have produced a total of 3,520,553 barrels of oil. 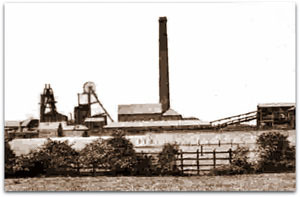 The North East Leicestershire Coalfield which would later include Asfordby was discovered in 1943 whilst drilling for oil in the Plungar field. It was in 1840 that the distillation of kerosene from petroleum was discovered and in 1859 the first modern oil well was drilled. As mentioned earlier it was oil seeping into coal workings at Riddings in Derbyshire that had created Young’s Paraffin and that had resulted in the first inland oil well in Britain being drilled not too far away at Hardstoft, near Tibshelf, on the Brimington anticline in 1918. This gave the concept of oil being discovered in the tops of anticlines and the Eakring anticline was thought to be a good bet, and it was. Note: Seismic surveys are carried out in order to discover the location of the oil and several oilfields are producing well today in 2014. It was noted that should a hole run dry or stop releasing gas then ‘hydro-fracking’ with water under high pressure was carried out to release gas from the strata as early as 1959. Furore in 2013 regarding proposed fracking near Blackpool where an area of gas sufficient to supply Britain for years was stopped under protest as it was assumed (being a new idea) that water, chemicals etc forced down holes would result in pollution of the water table and cause earthquakes etc. Fracking has been carried out in Britain for 55 years (2014), unknown to most people, without any problems and horizontal holes were drilled by lowering a tool down the vertical hole to bend the hole horizontally. This was a different kind of fracking however by only using water under high pressure to rejuvenate wells also. As yet it is an unknown factor as to whether the use of certain types of chemicals to break down strata will have detrimental affects in the future, on the water table etc. The USA has thousands of fracking holes, releasing gas in huge quantities lowering the price. This led to a major drop in the price of coal (registered in $ on the open World market) in 2014, leading to the death of the deep mine British coal industry. The first national holidays with pay for one week were awarded in November 1943, and in 1944 the rate for adults over 21 was £5 5s 0d (£5.25), for 18 to 20 year olds £4 4s 0d (£4.20) and under 18 years £3 3s 0d (£3.15). Birley East pit (South Yorkshire) closed on 26th October 1943. However the shafts were left open as the pit was to be used as a Training Centre for entrants to the mines, including Bevin boys and Poles who would then be sent to work at pits in Nottinghamshire and Derbyshire. The mine was sunk in 1888 by the Sheffield Coal Co. The total wages bill for Clifton colliery (Nottinghamshire) was £184,106 for the 588 workforce plus 17 clerks and salaried staff. Output for the year was 145,006 tons. Output improved to 181,072 tons with 709 men and boys in 1944 and the wage bill increased to £216,481. During January 1946 there was a problem at Clifton colliery where water was issuing in great quantities at Calladine’s drift. 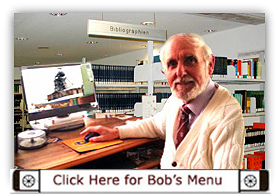 Harold Saul a Mining Engineer was consulted to give a solution to the problem. Output at Clifton (Nottinghamshire) for the final year under privatisation (Nottingham and Clifton Colliery Ltd), although under Government control would only reach 254,534 tons produced by 899 men and boys. The total wage bill was £275,881 13s 4d (£275,881.67) and the number of clerks and salaried staff had increased to 25. Incidentally Clifton was the first pit to be nationalised as it was taken over by the government during the war. Leicestershire 24s 4½d (£1. 21¾) per shift. North Derbyshire 14.4m tons, with 56 pits using 486 coal cutters, 45 pits using 756 conveyors, 50 gate end loaders, 12 power loaders. Leicestershire had 13 pits with 131 machines in use producing 4.39m tons. The National Reference Tribunal in January 1944 chaired by Lord Porter granted new minimum rates of £5 underground and £4 10s (£4.50p) on the surface. 20 years 80s (£4) underground and 70s (£3.50) on the surface per week. On 25th Jan 1944, 130 Bevin Boys billeted at Chesterfield were sent to Creswell Training Centre. On 21st February 1944 the first Central Training Establishment for the region was opened at Creswell (Bolsover Colliery Co). It released its first intake of 137 boys on 29th May. Shortly afterwards a fully reserved Training face was initialised at Gedling (BA Collieries Ltd). The Coal Mining (Training and Medical Examination) Order 1944 established the general principle that no one was to be employed in or about a coal mine on work which he had no previous experience, unless under adequate instruction and supervision, until competent to do the work without supervision. The Order also required Training Officers to be appointed to superintend training at collieries and keep records and reports on trainees. Bulwell (Nottinghamshire) had a pithead restaurant now. However the pit was soon to close in 1945. Grassmoor (Derbyshire) was the first pit to offer full cooked meals in a canteen. 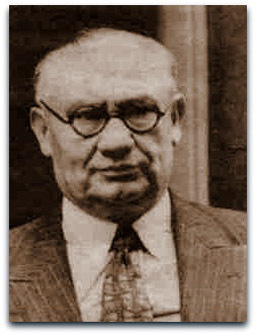 The Minister for labour and National Service, Ernest Bevin, raised the age of those able to avoid the conscript from 25 to 30 but this was a mistake with too many men leaving the mines to take advantage for better pay and labour conditions in munition factories and other war time industries. Also thousands of miners were leaving the industry every year due to retirement, invalidity, long term illness or death. Although there was a call for men to return to the pits this did not happen and very few answered the call. As a result a new scheme of conscription was devised and a new workforce called the Bevin Boys came into being. 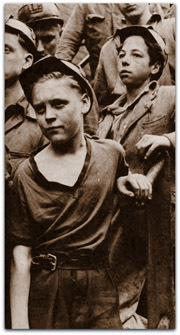 ‘Bevin Boys’ aged 18 to 25 were conscripted into the mines in late 1943 and through 1944 due to the war effort to produce more coal. Every 10th person called up for military service was transferred to the mines. It was a lottery. Every month Ernest Bevin’s secretary put 10 digits into a hat and for a period of approximately 20 months, two of these numbers were drawn out and all those men whose National Service Registration Number ended with one of those two digits were directed into the coal mines. There was no escape, except for those accepted for flying duties in the RAF and Fleet Air Arm or Submarines or certain men on a shortlist of highly skilled occupations required for service trades. They came from all walks of life and many such as sons of doctors or parsons etc had never seen a pit before and were quite unprepared for a job of coalmining underground. No underground toilets, it was left to a shovel upwind of others. There was nowhere to wash ones hands before eating the break meal (snap). Most were definitely not cut out for a life in mining. 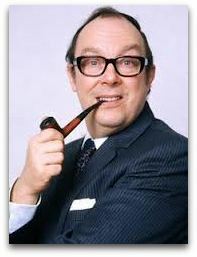 Famous names like Eric Morecombe and Brian Rix were two such recruits. They were usually accommodated first in local homes then in purpose built hostels (Nissen huts with beds for 12 men, and had lockers, lavatories and baths, there was a welfare centre and recreation room, dining room and food prepared by cooks) and received an average of £2 10s (£2.50) in pay (at 17 up to 59 shillings (£1.82), and at 21 years old, 39 shillings and sixpence (£1.96). Most pits received their quota of Bevin boys and after the war they were “demobbed” like the servicemen but received no gratuity. Out of 22,000 conscripts nationally, over 2,300 were taken into pits in Nottinghamshire. Many rules were laid down, such as no disorderly conduct, drunkenness, gambling, betting, borrowing or lending money. In this area, Creswell was a major sorting out and training centre, opened in January 1944, catering for up to 520 ‘boys’ at a time. The Bevin boys were allocated digs with local people and then started life underground training, usually with a big shovel shifting coal. Following the end of about one month’s underground training period or for some several months they were allocated to various other pits to fill vacancies left by enlisted men. Although many had never seen a mine in their lives before, 99% of them settled in to their new life fairly quickly although overall it was found that attendance was poor. The Forest Town hostel housed 500 with a Manager and a staff of 12. One Bevin boy Roy Dickinson, known as ‘Dicko’, told me in 2007 that he lived in Nottingham and wanted to join the RAF but was conscripted and sent to Creswell to train as a miner in October 1944. He had to go to London Road School, Nottingham for a medical. 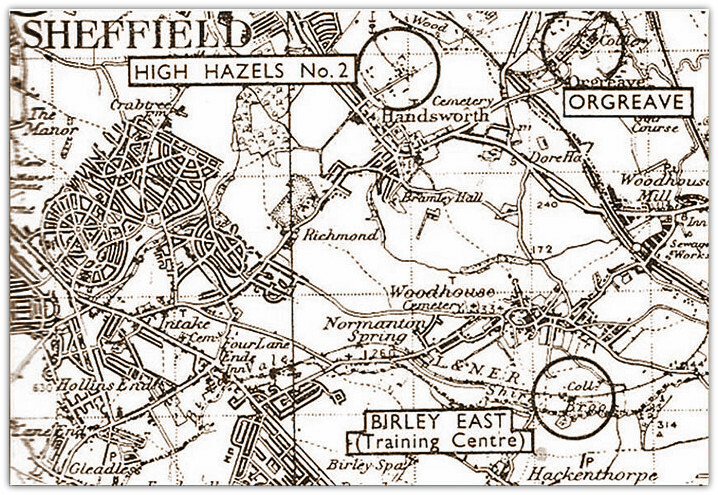 After being passed A1 fit he was transported to a Miners’ Hostel at Clowne housing 500 men. For about 6 weeks they did physical training, dressed in shorts and plimsolls. A good English breakfast was provided each morning and a good substantial 3 course meal in the evening. Sandwiches for snap were provided also. They visited several colliery surfaces to see the types of jobs on offer. He was allotted to Creswell colliery nearby for formal training firstly on the surface on various jobs such as sorting coal on the screens etc, then he was transferred underground but he reckoned they ‘played’ at being a miner there because they were always under the watchful eye of a Training Instructor who would help, but he got a great shock when sent to Gedling to do some proper work, on his own, firstly pony ganging then shovelling on a coal face for £4 a week. He recalled on one occasion when he lost his pony or ‘donkey’ as he called it. It had wandered off whilst he wasn’t looking, however when he returned to the pit bottom stables to explain he found the pony named Captain stood in his own stall waiting to have its gear removed, so he didn’t report it and carried on as though he had escorted the pony back. A piece of cardboard was put at the back of the hand lamp so that all the light was projected to the front so that it was easier to see where one was going. He hated the underground life having previously worked for Kettch and Sons hauliers as a driver and after about a year began to holiday on odd days like some miners did. Another part of his work was on the haulage underground where he had to clip 4 tubs of coal onto a moving haulage rope with great dexterity otherwise like some who were run down and bruised badly, luckily not too severely. Because he was more fortunate than the others who came from areas of the country not associated with mining and lived far away he lived nearby and it was easy to slip into Nottingham, eat his snap (sandwiches) on Slab Square, feed the pigeons, walk round then go back home at the recognised knocking off time as though he had been to work. After a time a letter was sent to his home from the colliery and opened by his mother who was ignorant of his absenteeism. They had to attend Court where his mother pleaded for him as he was unaccustomed to the underground life and it was affecting his nerves and the magistrates were lenient on this occasion, he was let off with a caution and ordered back to work. Of course being conscripted into the mines was like being in the forces and that action would have been classed as AWOL, (absent without leave). He said he was injured in the pit whilst on haulage work and as soon as he could in early 1947 when they were releasing miners from the pits he left. There must have been hundreds in similar circumstances who just had to ‘grin and bear it’. 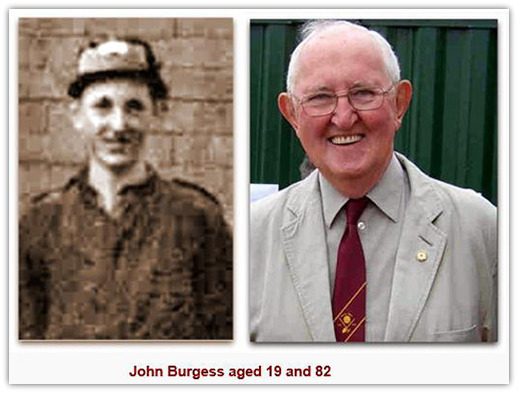 John Burgess (6153) (pictured aged 19 in 1944 and 82 in 2007, d 2012) was one such recruit in this area 1944-1947 who stayed in the industry. He originated from Winchester and did his training at Creswell, worked at Annesley pony ganging to start with, followed a management career, taking exams in mining and obtained a First Class certificate (Manager’s) and was promoted to Undermanager Bentinck, transferred back to Annesley, promoted to Deputy Manager Silverhill, temporary Manager at Teversal, promoted to Manager at Sutton then General Manager Harworth. Colin Wells (6005) also a Bevin Boy, started as a linesman at Annesley also became a ripper there whilst studying becoming an Undermanager at Pleasley and was a Manager at Shirland and then Silverhill. Jim Hewitson (5278) did likewise in Lancashire and became Manager at Rufford then North Nottinghamshire Area Safety Engineer before transferring to Industrial Relations in South Nottinghamshire. Frank Haynes was another who became an NUM official and later Labour MP for Ashfield. Frank Gearing another Bevin Boy was allotted to Silver Hill on haulage duties to 1946 when he transferred to the Surveyor’s underground lining staff. In 1951 he joined the Staff Superannuation Scheme and became an Assistant Surveyor at Silverhill eventually becoming First Assistant before transferring to No4 Area HQ Planning department at Huthwaite then leaving the NCB in 1960 to join Tarmac the civil engineering firm where he was involved with the underground tunnelling work for the Bala Dam in Wales, eventually reaching the position of Area Manager in the North East. The centre closed in June 1945. 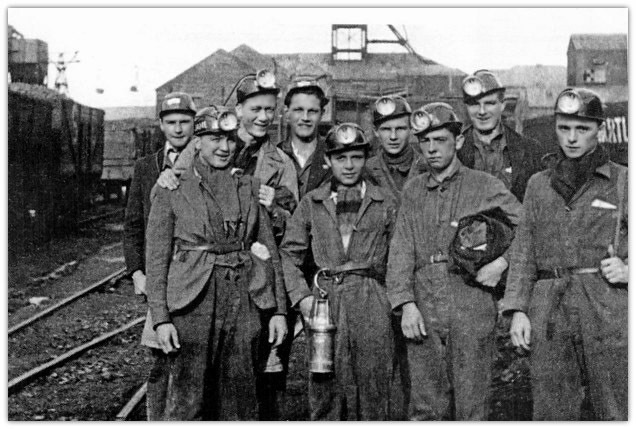 The first of the trained Bevin Boys in the Nottingham area started work at Clifton and Radford pits on 21st Feb 1944. Others would later go to Babbington, Bestwood, Wollaton and Gedling. By Autumn 270 Bevin Boys had been sent to the Ripley area, urgent calls to Nottingham householders required for homes for the Bevin Boys. John Berry was also a Bevin boy and he held several management positions in Scotland before being appointed to his position as Deputy Director North Nottinghamshire Area at Edwinstowe.